Pahmar-raht Renegade is an epic Agility creature card. It is part of the Core Set. "Khajiit will leave none standing." "Under moon and star, what do you want?" 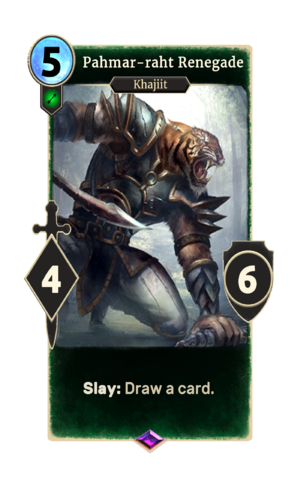 The card is named for the Pahmar-raht subspecies of Khajiit. This page was last modified on 16 February 2019, at 22:59.